For the original movie there wasn’t much in the way of party supplies for a Despicable Me Birthday party other than a few items that could be passed as favors. Sure, birthday party planners could have come up with creative ways to put together a Despicable Me themed party, but the tableware and other party supplies themed after Despicable Me was noticeably absent. 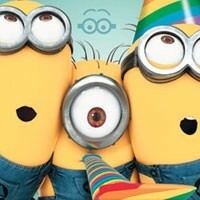 This time around, however, we’ll be seeing a full launch of Despicable Me themed party supplies. Let’s see what we can do to plan for villainously fun Despicable Me birthday party! Even the bad guy can be someone's hero! Despicable Me is a rather heartwarming 3D animated movie about a super-villain –and, ironically, main protagonist- named Gru who ends up adopting three girls from an orphanage. His grand plan is to outdo another super-villain –Gru’s biggest nemesis- Vector; who happened to steal the Great Pyramid of Giza. Naturally, for any super-villain, the next step up is the moon! Aiding Gru in his endeavors is the minions. Hardly anything like the henchmen of regular super-villains, these yellow, glasses wearing minions help Gru build the various contraptions to help bring his nefarious plans to life. Of course, they’re also one of the main reasons that kids loved the movie so much; which is the reason why they’re being heavily used in the marketing of Despicable Me 2. With the success of Despicable Me you knew there would be a sequel. Gru, the minions, and Gru’s adopted daughters return in this full-length featured film that appears to feature some sort of confrontation with aliens. Like the first, this one is sure to be a big hit with the entire family. Be sure to head over to the Despicable Me official website for a trailer and additional information on the upcoming Despicable Me 2 movie. Despicable Me Cupcake Rings – These cupcake rings feature the minions from Despicable Me. Perfect as favors, they allow your party guests to take home their very own minions. The Despicable Me cupcake rings come in packs of 12. Balloons, Streamers, and Solid Color Tableware – When choosing other party supplies or additional solid color tableware going with orange, blue, or even red will work. Yellow is, however, recommended recommended since it matches the minions best. Party Favors – A few official Despicable Me party favors will be available such as party hats and blowouts. Additional party favor options such as the various Despicable Me themed plush toys, minion sets, and even a stuffed unicorn are available. A quick search on Amazon and you'll find expensive Despicable Me party favors in no time. Despicable Me Invitations – Accompanying the Despicable Me party supplies are the invitations. Like the tableware, the invitations also sport Gru’s minions. The Despicable Me Invitations are the perfect way to tell your guest just how much fun your party will be! Despicable Me Coloring Pages – A quick search on Google Image will bring up a few Despicable Me coloring pages that you could print and hand out to the kids. They’ll have fun coloring their favorite characters from the movie. Despicable Me Piñata – Piñatas are an absolute blast at any birthday party. Unfortunately, there are limited options for Despicable Me piñatas, with those options being fairly expensive. Over on Etsy you can find a minion piñata. 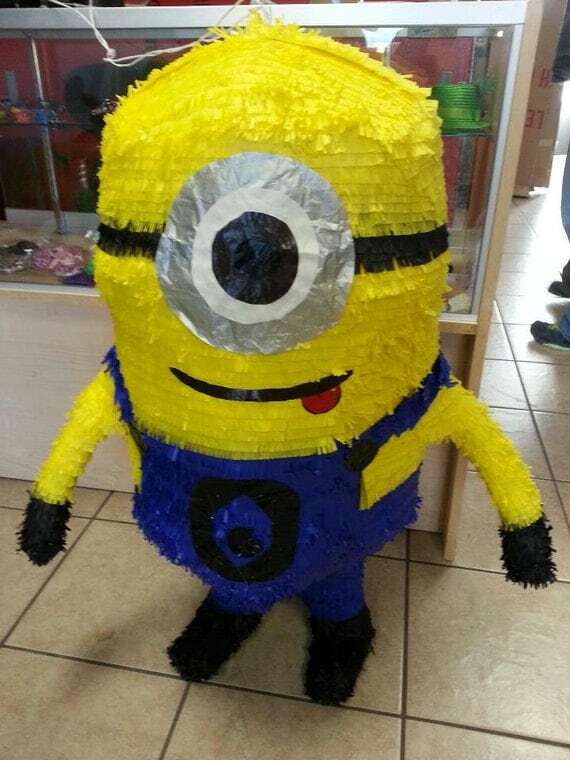 Or, why not have a little fun preparing for the party by making your own minion piñata? Check out this easy-to-follow article on making piñatas: How to Make a Piñata. Minion Scavenger Hunt – Another fun filled activity is a Minion Scavenger Hunt. The minion cupcake rings are perfect for this game. The winner is the person who finds the most minions, but make sure that all the kids receive a prize for participating. Stomp The Minions – Grab some yellow balloons, fill them up with small prizes such as candy or change, blow them up, and then add the finishing touch by drawing the minion glasses on the balloons with a soft tipped black marker. Trust me, the kids will love stomping the minions for the prizes. Throw a Monster High Party with these great ideas! Also, included is a basic party planning step-by-step guide. Have any Despicable Me party ideas or comments about the movie? Please share them!